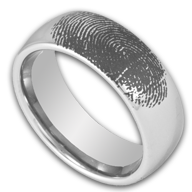 Combining fingerprint engraving with the durability of the Tungsten Band, our line of custom engraving fingerprint rings are second to none. Not only do our rings look better, have better contrast in their engraving than our competitors, and stand the test of time much, much better - they are also more affordable! 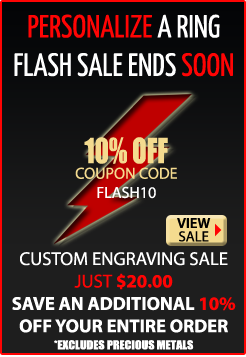 Most of our rings can be engraved on the outside with the technology we use for engraving, so if you don't see a style on this page that you are interested in with fingerprint engraving ready to order, just contact us and we will let you know if we can put the fingerprint on another band you may have in mind. Some of these are available in multiple colors which is an option you can select on the individual item page.